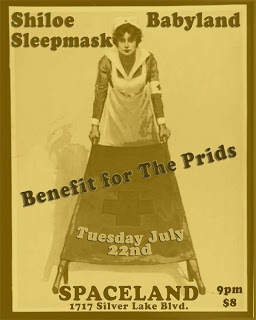 The Prids were set to play with us tomorrow night at Spaceland, but they were in a severe car accident last night which resulted in hospitalization for everyone on board. David was airlifted from the scene of the crash, he suffered a broken collar bone, broken ribs and has 6 staples in his head. He is still in the hospital. Everyone else has now been released from the hospital,but there are many injuries including broken bones. Our good friend Chris (from the L.A. band We Miss The Earth) was riding with them, and has suffered a broken arm, and may have spinal injuries. As you can imagine, this is all very expensive, and we are making tomorrow's show a benefit for them. Please come out and support a great band in need. If you are in the area, please go out and show your support. There is also a Paypal link for donations via The Prids' MySpace page. What awful news. I hope it's a really good turnout and my thoughts are with the injured for a speedy recover.